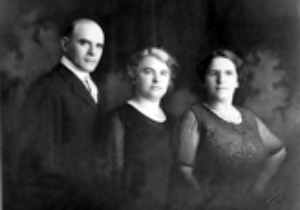 My great grandparents, Davis and Bessie Rubin, emigrated from Russia to North Dakota in the late 1800s and my grandfather, Herman Wilensky, emigrated from Russia in the early 1900s. 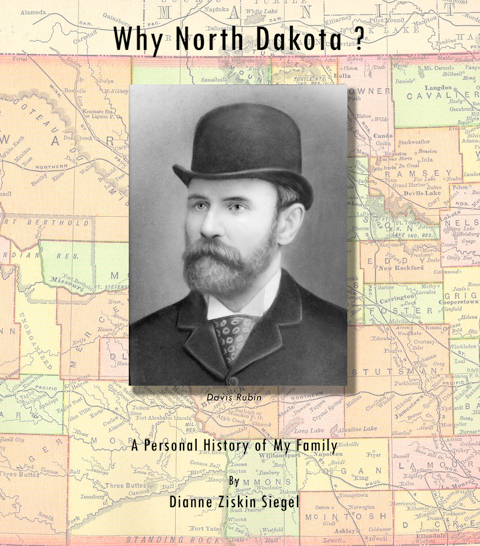 Both my mother and father were born in North Dakota and I have long been interested and fascinated about the history of my family and how and why they went to North Dakota. What possessed them to settle there? What could they have been thinking? What sort of people were they? My interest in family history and genealogy surfaced in the 1970’s, when two women from Fargo, N.D., Ruth Landfield and Toba Geller, advertised in the Jewish World, a local newspaper, that they were collecting the stories of Jewish families that had settled in North Dakota, and that they intended to write a book. I tried to get my mother to write something so that we could be included in this “book,” but she thought I should do it, and so began my investigation. Since both my mother and father were from North Dakota, I wrote about both of them in response to the request from the North Dakota ladies. I knew more about my mother’s family, because she grew up in Devils Lake, whereas my father left Grand Forks as a young boy. From hat initial experience began a long and interesting journey for me into family histories of all the various branches of the families of my husband, Leighton Siegel, and my own. It also led to two wonderful family reunions, the Siegel Reunion in 1981 and the Ziskin Reunion in 1988, which of course, proved to be great additions to the family history that had already been collected. In the early 90’s, the Jewish Historical Society of the Upper Midwest acquired the research that those two farsighted women in Fargo had collected. The collection had never been turned into the promised book, and unfortunately, Ruth Landfield became ill and Mrs. Geller died before anything happened with the collection. But here it was, and I had the unique opportunity of being the volunteer asked to put this material into a cross referenced database so that anyone interested in the Jews of North Dakota or a particular family could use it. The stories were fascinating, they sounded familiar and they had common themes running through them. It seemed to me that perhaps it was just as well that the “book” hadn’t yet been written since so many stories were the same – Jews emigrating from Russia, homesteading, farming, failing and leaving the state or moving into the nearest town and becoming a merchant. There were earlier emigrations of Jews from German and Russia who sometimes settled in small towns in North Dakota. Not everyone homesteaded; some became peddlers and merchants. The families that stayed generally prospered, but even those Jewish families eventually left North Dakota and moved to communities with larger Jewish communities or more opportunities for their children. And so I began to wonder, why North Dakota, why move to this unpopulated and rural state? And then I decided I would do some research and see if I could put together my own family history. All of the information that I have compiled is from research that I have done over the years plus of course, stories from my mother and members of my family. My husband and I took a field trip to Grand Forks and Devils Lake in 2005, and we finally saw the town with our own eyes. We returned for the dedication of the Jewish cemetery in 2006 and again in 2012. The year is 1893. Documents put Davis Rubin, my great grandfather, in New York City where he filed his declaration of intention to become a citizen after emigrating from Russia. He then, through luck or plan, used some money from the Baron de Hirsch Fund to make his way to Devils Lake, North Dakota. He didn’t come as part of an organized group. He did intend to homestead. Land was free and he was interested. Thirteen years later in 1905, my grandfather, Chaim (Herman) Wilensky also found his way to North Dakota and homesteaded near Williston, North Dakota. Again, land was free in North Dakota to the homesteaders. From 1881 to about the middle of 1882 an excess of 18,000 Jewish refugees arrived in New York City from southern Russia. They came to escape the cruel persecution of the Russian Czar. There were families, single men and a few single women. These immigrants were mostly tradesmen. They knew little about agriculture, and in fact were not able to own land in Russia. I had always heard the stories that the reason my great grandfather, Davis Rubin, went to North Dakota was because the Baron de Hirsch Fund offered money to entice him (and others) to settle in places like North Dakota. I became interested in who was this person and why was he so willing to help. Baron Maurice de Hirsch (1831 – 1896) lived in Munich, Brussels and Paris. He was a banker and a philanthropist. His total benefactions exceeded $100 million, mostly to Jewish causes. He believed that Jews would be better accepted in the New Country if they were more like the already existing population and that translated into farming. He first tried to improve the conditions of the Jews in Russia, but he decided that the political climate of that time was not in league with his ideas, so he founded the Jewish Colonization Association with an initial sum of 10 million dollars. His initial goal was to help Russian Jews emigrate. Leading members of America’s established German-Jewish community established the Baron de Hirsch Fund in New York in 1891 in order to provide assistance to Russian-Jewish immigrants in the United States with funds from de Hirsch. Baron de Hirsch’s will specified that his fortune be used to aid Jewish emigrants escaping Russia. Loans were available to people willing to farm, amounting to $1,000 per person or less. The terms of repayment were lenient. $1000 was a great deal of money in the late 1800s and early 1900s. There was another agency funded by the Baron de Hirsch Fund and that was the “Industrial Removal Office.” Removal in this case meant resettlement. This United States organization sought to encourage new immigrants to leave the large population centers on the East Coast and settle in the interior of the country. Resettlement in places like North Dakota certainly removed those individuals from places like New York. There were two different kinds of settlements. North Dakota saw both types. The first type of settlement consisted of establishing an agricultural settlement by bringing a group of Jewish people together in order to farm, start a colony and be supportive of one another. Painted Woods was an example of this kind of settlement. The second type of settlement was by individuals who received some money directly from the Baron De Hirsch Fund and came on their own in order to homestead. An example of this was my great grandfather, Davis Rubin. Interestingly enough, in Minnesota no special agricultural colonies were established; instead, the settlers who used the Baron de Hirsch funds were all individuals who became truck and dairy farmers. In the early part of the 1900s, the Industrial Removal Office in New York placed 1371 Jews in 40 Minnesota towns and villages. The wide spread settlement of Jews in Minnesota dates from this massive effort. Where collective settlement had failed as it certainly did in North Dakota, individual enterprise seemed to have had better success. My great grandfather, Davis Rubin, left the pogroms and persecution in Russia and as stated before, homesteaded outside of Devils Lake arriving in 1893. He says he arrived in Devils Lake in 1892, but his homesteading papers indicate it may have been 1893. His intention to become a citizen was filed in New York in 1893 and his actual homestead papers were filed in North Dakota in 1894. Davis was married to Bessie Waslowsky while still in Russia. Davis came alone. He was born in 1854 and was about 38 years of age when he emigrated. The family, Davis, Bessie, Daubra, Ida and Sam are listed on the 1900 census. The name is spelled Reubens. They appear again on the 1910 census spelled Rubin. The name Daubra becomes Americanized to Dora. Davis and Bessie came from South Russia, near Odessa, in the State of Kherson (Kherson, Gaberna). Rubin was not the original family name, but instead was the name of the family that brought Davis out of Russia. Or, perhaps a name that he acquired or bought to keep himself out of the Russian army. The original name is unknown. It’s possible that Rubin was spelled Reubens and it’s also possible that he changed his name upon entering the United States. He seems to first appear in New York City. An aside about names: It wasn’t until the mid 1800s,that Jewish families in Russia and Poland were compelled to take family names. And even at that, names were purchased to keep sons out of the Russian army and thus everyone in the family might not use the same name. Therefore, when people emigrated after that, they felt no great allegiance to this family name that had been chosen or thrust upon them, and changed it as they saw fit. Davis had at least one brother with whom he corresponded. The brother’s surname was Gordon and he lived in Egypt. When Davis came to North Dakota in 1893, it was a territory. He left his wife and children in Russia and 8 years passed before he was able to send for them. The original homestead was very large and was located between Starkweather and Edmore, near Devils Lake. Davis’ plat was at least twice the 160 acres each homesteader was given. 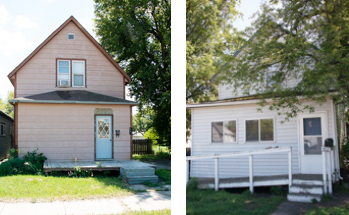 It was possible to purchase the land before the five years elapsed for $1.25 an acre. Apparently that is what he did. When his wife, Bessie, came to North Dakota, she also homesteaded an adjoining piece of property. Bessie claimed to be divorced in order to own property in her own name. (plat map attached). Davis began by working on other farms in order to earn money for his property as well as earn some extra money. The Historical Society of North Dakota printed a letter from Davis Rubin who was then a furniture storeowner in Devils Lake. This letter gives some insight into the conditions under which the immigrants existed. “I settled in 1892. I took a homestead and bought land (a quarter section). Got money from the Jewish Society of New York at six percent. We got money from the local banks at twelve percent and a bonus of ten percent, so can’t wonder a Jew couldn’t farm. The first Jewish settlement was founded by Baron de Hirsch. He was a millionaire and left money for these settlements. He built them homes and got them farming outfits, but most of them left in ’88 or ’89. There was no donations. When I come in 1892 all the colonial settlers left except three or four. Most of the Jews that came in the 90’s made good. The colonial settlers had a rabbi and everything in their religious line. But there was very little or no improvement in the county and very little to do. When they threshed, they slept in the straw piles and drank slough water, and they decided most anything would be better than farming, so they left. The Jewish Relief (Jewish Agricultural and Industrial Society) would lend $500 to $800 on a quarter section of land. My home was in Overland Township, T. 857, R. 62, Section 30”. At first Davis rented his farmland to others who farmed it. The farm was eventually sold. The farm was adjacent to the Calof homesteads and the families were very close. I have always liked the story about the dining room table that Abe Calof had on his farm. The middle of the table was cut out and operated like a lazy susan. It was controlled by a pedal, which Abe manipulated. The food was set in the center of the table and it came around only once. The family, friends and assorted others took what they could when the food stopped in front of them or else they missed their opportunity. Baila Calof, wife of Abe Calof, became a close friend to my grandmother, Ida Rubin Wilensky. It is her memoirs that have been turned into a book and offer the best description of what life was really like. The book is entitled: Rachel Calof’s Story. Davis Rubin’s story runs parallel with many of the other immigrants. After working for seven years, he saved enough money to send for his family, which was still in Europe. To make ends meet he contracted to work for a neighboring farmer for 80 cents per day for eight months, but was never paid for his labor. 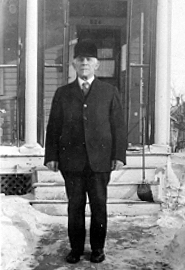 In 1907, after 15 years of farming, he left a half section of land with a mortgage of $4200 against it and moved to Devils Lake. His first job in Devils Lake was herding cattle. At a later date, he went into the junk business, which included the buying of wool and hides. His final and most successful business venture was the retail selling of furniture. The answer to the question of why so many Jews entered the mercantile world can best be found in Rubin’s brief biography: monetary success in the mercantile world came faster and more easily than in farming. Bessie Waslowsky Rubin arrived in Philadelphia in 1900. According to the 1900 Census she was born in April of 1855. It took Davis six months to go to Philadelphia to meet her and bring her back to North Dakota. Information from their Declaration of Intention to become a citizen contains the following information: Davis Rubin was naturalized on November 25, 1898. Bessie Rubin was born in Russia in 1855, she filed her intention to become a citizen on May 25, 1900. She arrived in Philadephia in April, 1900. Bessie brought only one child with her and that child was Dora. Two of her other children, Ida and Sam, were sent later by their Aunt Rachel. There is a family story that was told about Aunt Rachel who asked her small niece, Ida, to name a child after her. This memory came to Ida in a dream after giving birth to her second daughter and so inspired Ida to name that baby, Rozella. Ida, my grandmother, was born in October 1879. She was 15 or 16 years of age when she arrived in the United States. She stayed in Philadelphia with relatives and initially went to school there. I don’t know a great deal about my great grandmother, Bessie Waslowsky Rubin. She died in 1919 at the age of 64 just before my mother’s youngest sister, Bess Wilensky Barenbaum was born. There doesn’t seem to be any indication of what happened. She hadn’t seemed ill to the grandchildren. My mother, Pauline, remembers being in school and someone coming to get them. The children were taken to Morris Glickson’s house and left with the housekeeper. According to what I have been told, there were always enough men for a minyan in Devils Lake. It was often my great grandfather, Davis Rubin, who conducted services, which were held in people’s homes or on the High Holidays in the Court House. Once in a while, a Hebrew teacher would come from the “old country” to live in Devils Lake and teach the boys Hebrew and help prepare them for their Bar Mitzvahs. Davis Rubin would often act as Rabbi on those occasions. The religious men in town were Davis Rubin, Mendel Mill and Abraham Adelman. She had relatives in Philadelphia and had a cousin living in Winnipeg who was named Nutra Shack. His wife was Pauline. Nutra Shack had a sister named Clara Lipshitz. Both Clara and my grandmother Ida were named Chya after their grandmother who was also named Chya (that would be my great great grandmother Chya). As is the custom in continuing names through the generations, our daughter Lesli is named Chya. Still later, the fourth child of Davis and Bessie came to Devils Lake. His name was Max. He left a wife and a son and daughter in Russia when he came. Max was a carpenter. None of Max’s family ever joined him in this country. Correspondence was maintained, but the last trace was lost during the Second World War. After the War, a letter was received in North Dakota addressed to Rubin. Money was sent, but the contact was lost. Bessie and Davis had eight children, four survived and all four eventually joined the parents in North Dakota. Bessie and Davis had two sets of twins. However, of those two sets of twins, only my grandmother Ida survived. Twins reappear in future generations, specifically my husband, Leighton, and I have identical twin daughters, Pam and Lesli and John and Sarah Adelman who settled in Winnipeg had fraternal twins, David and Barbara. Davis and Bessie lived next door to the furniture store. The two buildings are pictured below as they appear in 2012 on 2nd Street and 5th Avenue. Davis married again. His second wife was Rachel Adelman Lieberman. They were divorced after 5 or 6 years. It was rumored that she was interested in his money. In the divorce proceedings, she got the house that Davis owned. He then moved in with his daughter and son-in-law, Herman and Ida Wilensky, my grandparents, and their children in the house on Kelly Avenue. When Davis was 82 years old, he decided it was time to die, the year was 1936. He went to Grand Forks and planned his funeral. He came home, trimmed his mustache, lay down and died. By this time three of his grandchildren were no longer in Devils Lake. Rozella and Pauline were living in Minneapolis and Marian was living in Chicago.
. Herman and Ida Wilensky moved to Minneapolis in the 1930s. The children had gone to the cities and all that was left were cemeteries.